India Travel Forum | IndiaMike.com - Jodhpur - Ranakpur - Udaipur by bus?? Jodhpur - Ranakpur - Udaipur by bus?? Just wondered if anyone knew of any bus companies that do a one day bus trip any days in June from Jodhpur - Udaipur and stop off at ranakpur to view the temples on the way? There are some threads about this subject shown at the left of the screen (or on the end of the thread). RTDC organizes a day trip to Ranakpur and Kumbhalgarh from Udaipur. You can check with them. The trip starts from Hotel Kajri located near Shashtri Circle. 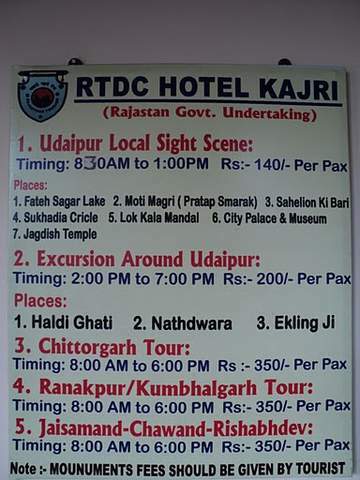 I am planning a day trip from Udaipur to Ranakpur/Kumbhalgarh , and it seems that RTDC organise exactly what I'm looking for. But I can't find more detailed information on RTDC web site about this tour ??? You would need to check with Hotel Karji (RTDC run) near Shashtri Circle Udaipur. As I understand I must contact Hotel Karji to book this tour ? Should I stay in this hotel or this is not necessarily ? It is not necessary to stay in that hotel. You will need to call them up and book a seat for yourself. Also ask them about the departure time and reach around 30 minutes prior to the departure time. I was there last September and when I inquired I was informed that during season they organize a bus and during off season they organize a car / SUV depending on the number of people. I was quoted by an Hotel for taxi from Jodhpur to Udaipur with a stop to Ranakpur for 2600rp and 2800 with A/C including taxi toll and parking. sounds like a deal...I read that buses take very long so im leaning towards the taxi. All times are GMT +6.5. The time now is 00:33.